Hammerwich station on the LNWR's Lichfield - Walsall line is one of the few sites of long-gone stations that I have visited where I have been pleasantly surprised by what remains. 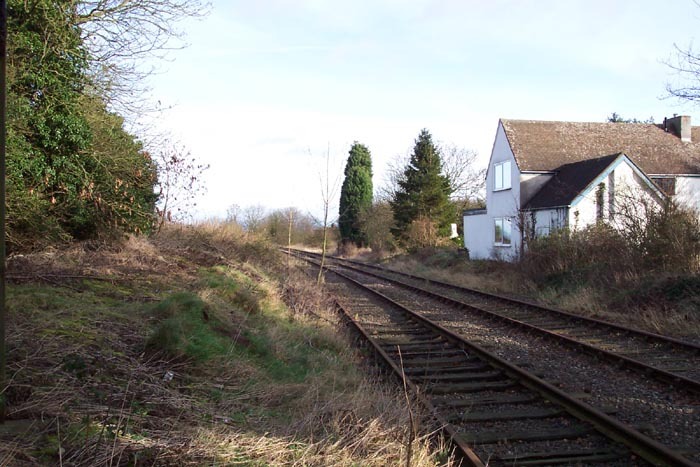 Opening in 1849 under the South Staffordshire Railway (later to come under the auspices of the LNWR), the station served what was then, as is now, a relatively small semi-rural village near the Cannock coal fields. Although relatively light on passenger numbers, the station remained open serving the Burton - Wolverhampton route until 1965 when, following the Beeching Report's complete decimation of all passenger routes to/from Walsall (apart from the New St - Walsall service that, following a struggle, survived), the death-knell was finally rung for the line as a passenger concern. 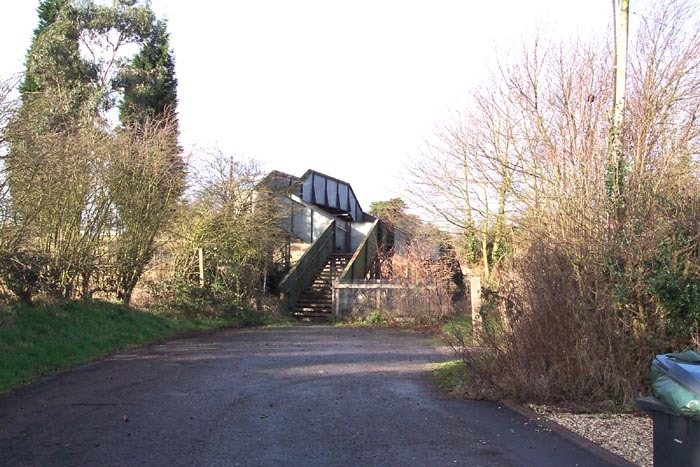 The line itself remained in situ, and some use, as a through route between Lichfield and Birmingham until 1983 however, all that remains today is the section of track from Lichfield to just north of Brownhills retained to serve an oil storage depot at the latter. 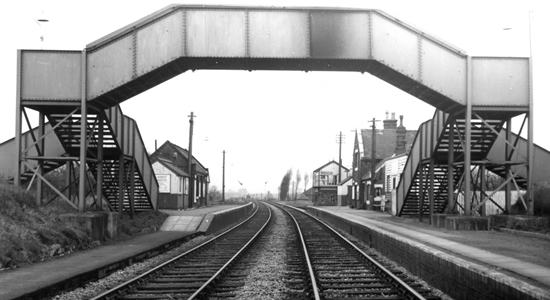 Above we see the station in happier times (photo: Roger Shenton) in 1964 looking towards Burton on Trent. 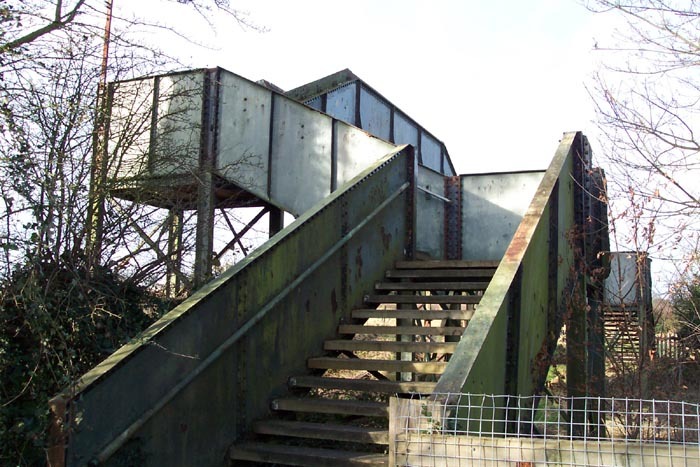 Above-left we are entering Station Road from Lions Den and I was very surprised to see the distinctive station footbridge still in place. Above-right we have walked a few yards ahead from the previous shot and looked to our right and can see that the station building itself is still in good repair as a private residence: albeit externally rendered since its days seen in the 1963 photograph above. Above-left we are at the base of the footbridge about to ascend: the general state of the bridge is considerably better than many I have come across at operational stations! Above-right we are on the footbridge looking towards Lichfield. 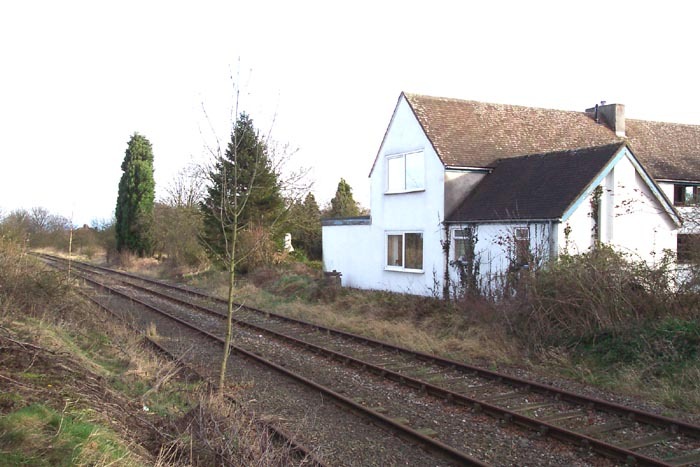 The distinctive platform-side of the station house can clearly be seen here although the platforms themselves have long-since been removed. 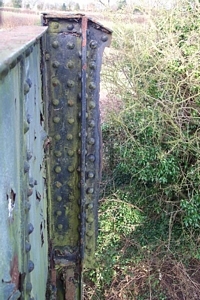 Above-left we are still at the top of the footbridge looking at the track heading off towards Walsall, although, as mentioned above, today the track does not extend much further than this spot. Above-left we have descended the footbridge to the Lichfield side of the track and can see remains of railway picket fencing to the left of the stairwell. To the rear of the photographer was countryside with a herd of Highland Cattle looking-on rather bemused as I clambered around the site! Above-left we are under the footbridge on the Lichfield 'platform' looking in the direction of Lichfield itself. 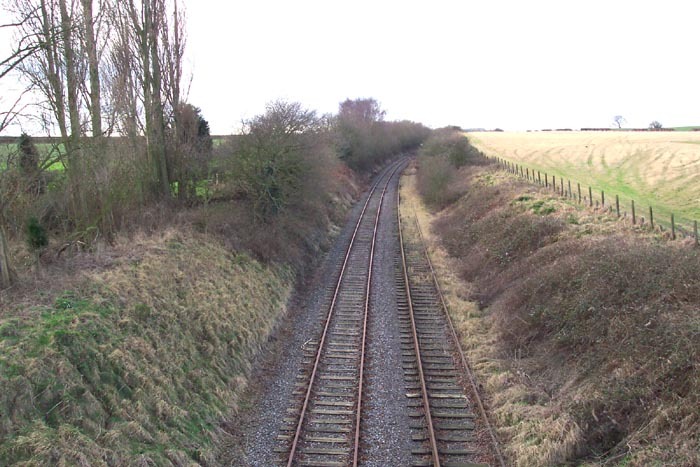 Although the platform edgings do not remain, the mounds that once formed the platforms are clearly visible either side of the track although the section immediately passing the station house has been scalloped presumably to give a more spacious vista for the large window looking out onto the track (once the site of a doorway leading to the platform). 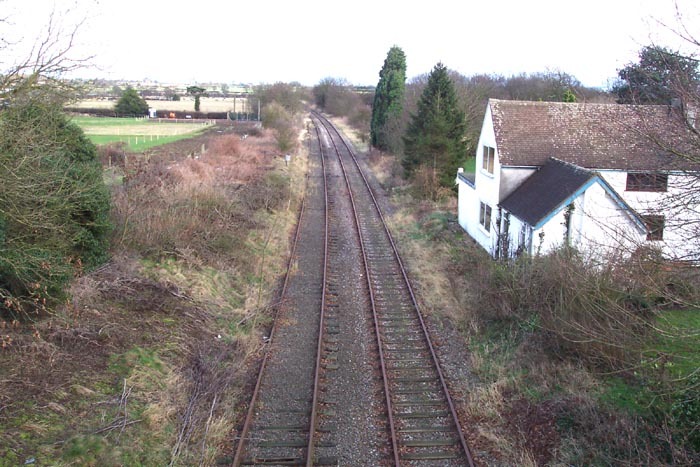 Above-right we take a closer look at the station house track-side and comparisons can easily be made with the 1963 state of the building shown at the top of the page. Above-left we are still on the Lichfield platform and recreating the view of the 1963 photograph but unfortunately not accurately as I felt it somewhat 'rude' to cross the tracks and take a photograph directly outside the window of the station house. The most notable distinction here is the absence of the sections of the footbridge bringing steps down to the platforms. 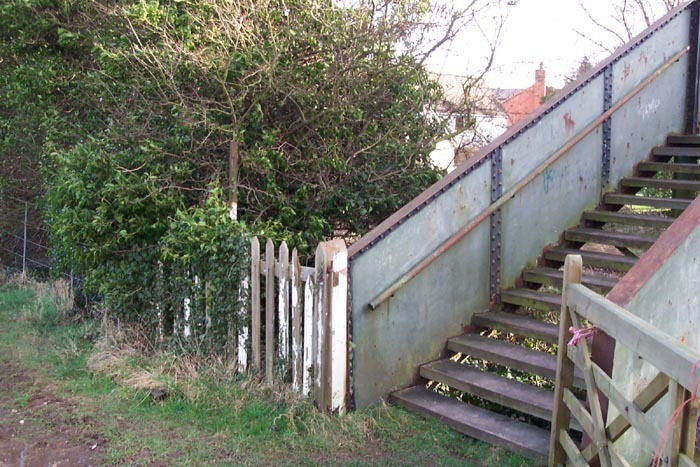 As these were ended at platform level - which has now been lowered - and there is no need for them anymore, the platform sections were cut-off and the 'landings' blanked-off where the stairs would have descended. Above-right we can see where the staircase to platform level has literally been cut-off on the Lichfield side of the footbridge.